There used to be a show on ABC called Extreme Makeover: Home Edition. If you’re unfamiliar with it, it’s pretty much what it sounds like. Loving neighbors nominate a friend or family member who has fallen on hard times and needs work done on their house to receive a free home makeover. The producers of the show treat the chosen family to a vacation while local contractors go to work remaking the house in a week while the occupants are busy. If the house is deemed beyond repair, they just demolish it and build a new one. This, of course, is all filmed for our enjoyment. In the text from 2 Samuel 7 we heard, “Now when the king lived in his house and the Lord had given him rest from all his surrounding enemies, the king said to Nathan the prophet, ‘See now, I dwell in a house of cedar, but the ark of God dwells in a tent.’” King David basically wants to do an extreme makeover for the Lord’s house. He sees that he lives in this nice strong house made of cedar. Him being king, it’s probably extravagant. David lives in a house, but he sees that the ark of God remains in a tent. He decides he’s going to do something for God, then. God responds through the prophet Nathan that He has something else in mind: God is going to build a David a house, one which will last forever. In this house of David, the throne will be established forever. This is no mere mortal house, rather, it is the house that Christ established, and it is His throne that lasts into eternity. Certainly David’s desire is pious. It is well-intentioned and comes from the heart. It maybe is a desire that many of us can identify with. A number of us here can remember the old sanctuary and the building of the one we are currently in now. We call the church the “house of God,” so that’s something else we have in common with David. Even Nathan the prophet said to the king, “Go, do all that is in your heart, for the Lord is with you.” Now that the Ark of the Covenant had been brought to Jerusalem, a feat in itself since David had to defeat the people who already lived there, Israel’s enemies have been defeated and David received rest from the Lord. The Biblical witness of David is that he is a man of war, a man with blood on his hands. But, the Lord is with him. God Himself testifies that it was He who went before David cutting off all his enemies, just as God led the people in their wandering and their conquests. But now, that time has passed. At least for a little while, there will be rest in the land as God has granted it. In this rest David happens upon the fact that he is living comfortably in a palace, while God sits in a tent. So, he figures, if he can build a house for himself, he might as well have a go at making one for God, too. That sounds pretty good, at least initially. Nathan speaks for himself that it’s a good idea and encourages David to go ahead. God continues His Word: “In all places where I have moved with all the people of Israel, did I speak a word with any of the judges of Israel, whom I commanded to shepherd my people Israel, saying, ‘Why have you not built me a house of cedar?’” He says that from the day He brought up the people of Israel from Egypt up until now, He has not lived in a house. Neither did He speak a single word with any of the judges about building a house for Him. Even if He did ask for a house, how could man build a house for God – He whose throne is the heavens and footstool, the earth? In the Gospel text Gabriel testified to Mary what Scripture had long promised, “[Jesus] will be great and will be called the Son of the Most High. And the Lord God will give to him the throne of his father David, and he will reign over the house of Jacob forever, and of his kingdom there will be no end.” This is the truth that David understood as well, as we can read in his response later in 2 Samuel 7. The house that God was referring to is not one built by human hands, though the kingdom and temple of Solomon would serve to foreshadow the coming of Christ. The house that God means is one that lasts forever, where people have a place to find security and peace. The house that God means is His house, the Church. We do not mean a house that God Almighty physically rests in, but it is the place where He dwells and makes Himself available to His people. We are human and so God has provided a place where we can go to receive His gifts and be in His presence. The throne that lasts forever is as the Gospel text says – Jesus’. This throne He reigned on from the beginning, and yet He stepped down from it to be born of the Virgin Mary, the event we will shortly be celebrating. He set aside His throne and glory to take our flesh upon Himself. He became Immanuel, God with us. In His body He carried our sin and reconciled us to God by destroying the powers of sin and death through His death on the cross. After His death He no longer restrained His glory, instead He proclaimed to the souls in prison that death had no power over Him. He appeared to hundreds of people, healing their diseases, and then He ascended into heaven to sit at the right hand of God the Father. The right of the Father is not some location separated from us in time and space, but rather, it extends everywhere and lasts forever. Where can we see it? Here. Here in the Church is where Christ dwells and is among us. Here He comes to us with His Word and Sacraments to forgive us, to strengthen us, to renew us, and to reassure us that He is coming again. Amen. Come, Lord Jesus. The Holy Bible: English Standard Version (Wheaton: Standard Bible Society, 2001), 2 Sam. 7:1–2. During the beginning of Jesus’ earthly ministry He went all around Galilee, teaching in the synagogues and being praised by all. Then He went to Nazareth, His hometown. It was His custom to go to the synagogue on the Sabbath day. There He stood up to read and the scroll of Isaiah was handed to Him. He unrolled it and it opened to our text this evening. He rolled the scroll back up after He had finished reading and said to all the people staring at Him, “Today this Scripture has been fulfilled in your hearing.” The account ends with Jesus’ own people driving Him up a hill to try and throw Him down the cliff. Jesus claims our text this evening as His own. The work of God’s servant in the text is Jesus’ own. Christ did not come to be a new lawgiver, He did not come as an example, nor did He come to make us try harder. Instead, Jesus Christ, the anointed Messiah, came to proclaim the year of the Lord’s favor and to release the captives of the law of sin. Jesus came to bring good news to the poor and to set the prisoners free. The text begins, “The Spirit of the Lord God is upon me, because the Lord has anointed me to bring good news to the poor; he has sent me to bind up the brokenhearted, to proclaim liberty to the captives, and the opening of the prison to those who are bound; to proclaim the year of the Lord’s favor, and the day of vengeance of our God; to comfort all who mourn.” This reading comes from near the end of Isaiah. The Fall of Jerusalem has been prophesied, as has the return from exile. The tone then shifts to the coming Day of Judgment. God laments, “I was ready to be sought by those who did not ask for me; I was ready to be found by those who did not seek me. I said, ‘Here I am, here I am,’ to a nation that was not called by my name. I spread out my hands all the day to a rebellious people, who walk in a way that is not good, following their own devices; a people who provoke me to my face continually.” Thus, wrath is coming for those who reject God’s favor. But that is not our text tonight. Here the Lord speaks of salvation, of His work on behalf of sinners. Jesus says that the Spirit of the Lord is upon Him and He has been anointed to bring good news to the poor. Many at Christ’s time were looking for a Messiah to come who would be an earthly ruler. They expected a king that would throw off the Romans and establish a new kingdom. I guess the flip side is that, in order to establish a kingdom, rules and taxes need to be imposed to make things work. That’s not what Christ came to do. He did not come to impose, but to bring cheer to the poor and afflicted with His good news. The Spirit of the Lord was upon Christ to come and bind up the brokenhearted. Christ came to bind up those have been broken by life, those who have been tossed to and fro by the waves of the world. He came to save those who sought after the world, its riches and pleasures, only to end up in the gutter brokenhearted. But this brokenhearted means something else as well. It means those who have been broken by God’s Law. It means those who have tried and tried to be a good person, and yet have found themselves lacking. Christ came for those who hear God’s Word and wonder how God could demand things we cannot do, and then punish those who don’t do them. That’s brokenhearted there. Jesus said that He came to bring good news to the poor and to bind up the brokenhearted. He also came to proclaim liberty to the captives and the opening of prison to those who are bound. In the Greek text, it says that He came to bring recovery of sight to the blind. Christ came to bring liberty those in the chains of sin and in the prison of death and the devil. These are also the chains worn by the brokenhearted, the chains of the Law. Prior to faith in the Messiah the Law hangs around all our necks demanding that we do work to earn the forgiveness of sins and to inherit eternal life. Christ came to set us free from that as well. The text proclaims that the Messiah came to bring good news to the poor, to bind up the broken and to proclaim liberty to the captives. The question is, how? How do all these things take place? How are ashes exchanged for a beautiful headdress, or mourning for the oil of gladness? I think you know the answer. These things happen through Jesus Christ, through His saving work on our behalf. It was for us that He created the earth. It was for us it was promised to Adam and Eve that one would come to destroy the power of the devil. For us, Jesus took upon flesh and was born of the Virgin Mary. Jesus is the Son of God incarnate. He is both perfectly God and perfectly man. He fulfilled the Law perfectly, and then suffered and died for you. He took your sin, and the sin of the whole world upon Himself. God Himself suffered brutally so that your sins could be forgiven. And so they are. This is not because we are especially good, and it certainly isn’t because it’s what we deserve, but it’s because God is love. In love Jesus Christ was born to proclaim the year of the Lord’s favor, the forgiveness of our sins. In love, He has clothed us in His own robe of righteousness, purchased by His own death on the cross. Amen. The Holy Bible: English Standard Version (Wheaton: Standard Bible Society, 2001), Lk. 4:21. I love the opening words of Psalm 126, “When the Lord restored the fortunes of Zion, we were like those who dream.” The psalmist recounts the astounding grace of the Lord God who abundantly cared for His people, and in the time of the psalmist, returned the people from their captivity in Babylon. His favor was so great, that His people lived like those in a dream. In the movie, A Christmas Story, Ralphie Parker dreams about one thing: A Red Ryder Carbine Action 200-shot Range Model air rifle. This BB gun is the one thing that he wanted for Christmas. Throughout the movie, this is the focus of his thoughts and dreams. Even at the end, the adult Ralphie reflects back on his receiving the gun as the best present ever. When he got it, it was like he was dreaming. Throughout the Old Testament God worked in and around His people for their benefit. When they rebelled against Him, He disciplined them. He continually blessed and watched over them. Even in their exile, He did not abandon them, but instead restored their fortune by returning them to the Promised Land. His action was such that the surrounding nations took notice that the Lord had done great things for His people. As this was the case for the Israelites returning from exile, so the Lord has restored our fortunes as well. We, who once were dead in our sins and captive to the powers of the devil, have been restored by Jesus Christ. By His death on the cross He has restored our fortunes, and He will restore them again. The text begins, “When the Lord restored the fortunes of Zion, we were like those who dream. Then our mouth was filled with laughter, and our tongue with shouts of joy; then they said among the nations, ‘The Lord has done great things for them.’ The Lord has done great things for us; we are glad.” Here the psalm writer recounts the great deeds of God on behalf of the children of Israel. Most commentaries say that the specific application of this psalm is in response to the return from Babylon. The nation of Israel had a long and sordid history in regards to their relationship with God; it often was an unfaithful relationship on their part. This lead to the destruction of part of the Northern Kingdom by the Assyrians and the destruction of Jerusalem by the Babylonians in 587 B.C. The return may have been the freshest work of God in mind, but it was by no means the only work. Israel entered the Promised Land in 1406 B.C., but even 700 years before that God had promised the Messiah to Abraham, saying nothing of God’s grace and forgiveness shown to Noah, Adam, and others. Instead, though God’s people were always in a state of flux, God’s love remained constant. There’s a situation that comes to mind as an example. For a long time after Israel entered the Promised Land they were ruled by the Judges. They did not have a king. Then, in 1 Samuel 8, that changed. Seeing that the prophet Samuel was growing old, Israel demanded a king so that they could be like the other nations. God tells Samuel that, from the day He brought them out of Egypt, His people have done nothing but forsake Him and serve other gods; and now, even more, they are rejecting Him again. It’s sort of like how Ralphie got his Red Ryder BB gun. Israel got their gun, but then they actually did shoot their eye out. Because of this, God’s people were carried into exile. Jerusalem was destroyed. But that didn’t last forever. God soon acted through Cyrus, king of Persia (538 B.C. ), to return His people to the land and restore their fortune. As God restored the fortunes of Israel when He returned them from exile, His Holy Israel – us – has been restored from our captivity to sin. This has been accomplished completely through the work of Jesus Christ, without anything on our part. Like Israel in captivity and powerless against Babylon, we were once all enslaved and in the chains of sin, death, and the devil. Some professors say that once the people were in exile, Babylon was relatively unconcerned with them. But our captivity to sin was much different. St. Peter said that the Devil prowls around like roaring lion, seeking someone to devour. He will never be satisfied until he has murdered and led away from Christ every single person on earth. His roaring and battle against us is such, that as St. Paul said, “I see in my members another law waging war against the law of my mind and making me captive to the law of sin that dwells in my members.” Even greater than the return of the people to Israel, is the truth that, by His death and resurrection, Jesus has rescued us from the guilt of our sin, from the eternal death that we deserve. Psalm 126 continues, “Restore our fortunes, O Lord, like streams in the Negeb! Those who sow in tears shall reap with shouts of joy! He who goes out weeping, bearing the seed for sowing, shall come home with shouts of joy, bringing his sheaves with him.” The psalm shifts gears from recounting God’s grace that has made His people dreamers and how His work has been made known among the nations, to a prayer and an assurance of things to come. The joyous return from captivity, both for the children of Israel and for us, is short lived. We’ve heard the last couple weeks about how mankind is like grass that blows away. The return to the Promised Land soon turned from joy to weeping. When Israel was carried away, different people then filled the land. And when they returned, they were met with contempt. That was the time of Ezra, Nehemiah, and Esther. They met opposition not only in trying to rebuild the Temple and Jerusalem’s walls, but people tried to wipe them out entirely. Though we have been rescued from our enslavement to sin through the work of Jesus Christ, which we receive through the gift of faith, we are also faced with the harsh realities of life. We all know that outside these walls, and sometimes within, life is not easy. The psalm talks about sowing in tears. It’s like when a farmer sows his seed and for a while is in the lurch about what’s going to happen: whether it’s going to be a good crop, whether prices will hold, whether his family’s going to hold. That can lead to much distress. Even in our personal lives it seems that we often sow in tears. Even in the church. It feels like we work and work, and we toil and labor, and it looks like nothing is coming up. Therefore we pray that the Lord would restore us like streams in the Negeb. The Negeb is an arid region in the southern part of Israel that gets less than 8 inches of rain a year, almost none from April to October. Then the winter comes and it brings with it what seems to be a torrent of rain and the parched soil just can’t hold it. Water pours out everywhere, becoming a life-giving flood in the wilderness. As Jesus was in the upper room with His disciples on the night He was betrayed, He taught them: “Truly, truly, I say to you, you will weep and lament, but the world will rejoice. You will be sorrowful, but your sorrow will turn into joy…you have sorrow now, but I will see you again, and your hearts will rejoice, and no one will take your joy from you.” How well we know that to be true. Jesus promised that the world will hate us, and that we will weep and lament. It so often seems that life is just a pointless endeavor, it’s nothing but stress and turmoil. But, Jesus says, though you have sorrow now, you will see Him again. When you see Him again, your heart will rejoice, and nothing can take that from you. Though Israel continually rejected God, still He persisted in love towards them. He rescued His faithful children and restored their fortunes by returning them from captivity. Though we once were in slavery to sin, and though we are beset by it on all sides, Jesus Christ has restored us. Through His death, He has cancelled the hold that sin had over you. In this life, even though we are made new in Christ, we will have sorrow. But the truth is: Christ has not abandoned us. He is with you always and in every situation. He has promised that He will return, and all sorrow will be no more. For at His coming we will rejoice and no one can take that away from us. The Holy Bible: English Standard Version (Wheaton: Standard Bible Society, 2001), Ps. 126:1. Last week we heard Isaiah’s prayer and plea to God, “Oh that you would rend the heavens and come down, that the mountains might quake at your presence.” He saw the destruction and adversity, the shame of God’s people, and prayed that God would come and destroy evil. But he soon realized that, if God put a sudden end to sin, then we should be rightfully swept away like a leaf in the wind. This righteous God who is holy is like no other God, in that He actually acts in lives of His people, would be justified in blowing us away. Isaiah concludes his prayer by reminding God that we are His people; we are the clay and He the potter. He has made us and He is merciful. God’s message to Isaiah comes after an envoy came from Babylon. They came to visit with King Hezekiah and he took them around and showed them everything: everything of value in all the kingdom. Then the Lord spoke through Isaiah that everything he showed them would be carried off to Babylon, even some of his sons. The resounding point in all this is that punishment and destruction were about to come upon Jerusalem and God’s people. There is forgiveness for the sins that they committed, their continual rejection of God and worship of false gods, their hatred and greediness, but the consequence is that Jerusalem must be destroyed. For some of God’s faithful people this led to despair. They couldn’t help but think that God was abandoning them. He was permitting Jerusalem and His own house, the Temple, to be destroyed and the people along with it…or so it might’ve seemed. Thus God speaks to them His Word of comfort. He tells Isaiah to speak tenderly to the people, to speak to them heart to heart, to cry to them and keep crying as the Hebrew says that her warfare is over. Her time of trial, her time of distress is now ended. Her iniquity has been pardoned. The word for “pardoned” here is the word used in Leviticus for when God accepts a sacrifice of blood. Payment has been made in blood for the transgression of God’s people and they are pardoned. The work of the Suffering Servant, the One who was pierced for our transgressions and crushed for our iniquities, has resulted in God’s people receiving double from His hands. This is not double punishment, because the Law says transgression and punishment must correspond, but it is grace. By the suffering of God’s Servant, Jesus, His people have received enough forgiveness to cover twice the penalty of their sin. And we need it too, because “all flesh is grass…the grass withers, the flower fades when the breath of the Lord blows on it.” No one needs to tell us how frail human flesh really is. Some make it to old age, but not without sickness and calamities on every side. We can also see new definitions of morality and a moving center of right and wrong all around us. These things are result of both the sin within us and the broken creation we live in that is tainted by sin. “The grass withers, the flower fades, but the word of our God will stand forever. Go on up to a high mountain, O Zion, herald of good news; lift up your voice with strength, O Jerusalem, herald of good news; lift it up, fear not; say to the cities of Judah, ‘Behold your God!’” Though mankind is by nature transitory, both in the fact that we will physically die, and how even as Christians our moral center is sometimes hard to nail down, the Word and Promise of God stand forever. Man withers and fades; man is fickle. God is strong, unchanging, merciful. He has promised to remember the sins of His people no more, to no longer hold their iniquities against them. This He has done by sending His Son into the flesh to die as payment for our sin. The Holy Bible: English Standard Version (Wheaton: Standard Bible Society, 2001), Is 64:1. Isaiah prays that God would come down from heaven, but he soon realizes what that would actually mean for us. Truly God is near to those who work righteousness, who delight in His Law. But what about us? Isaiah asks, “In our sins we have been a long time, and shall we be saved?” Our God is holy and cannot tolerate sin. Isaiah prays that God would come down and destroy evil, but what does that mean for those like us, who have “all become like one who is unclean, and [whose] righteous deeds are like a polluted garment”? Nothing good. Already, we as humans are like a leaf that fades in the fall. We have fallen off the tree and we perish. Our sins, like the wind, carry us away. God does meet those who joyfully work righteousness and remember His ways, who call upon His name and wake up early to study His Word – but how often does that describe us? Instead we already melt in the hand of our iniquity. If the Almighty God tore open the fabric of time and space to put an end to all evil and darkness, He would be putting an end to us as well. It would be like in Raiders of the Lost Ark when the Ark of the Covenant is opened and everyone literally melts at the power of God. And so Isaiah pleads, “But now, O Lord, you are our Father; we are the clay, and you are our potter; we are all the work of your hand. Be not so terribly angry, O Lord, and remember not iniquity forever. Behold, please look, we are all your people.” God is our Father, and without Him we would not even be here, where we are now. Like clay in the hands of the potter, so are we in the hands of God. 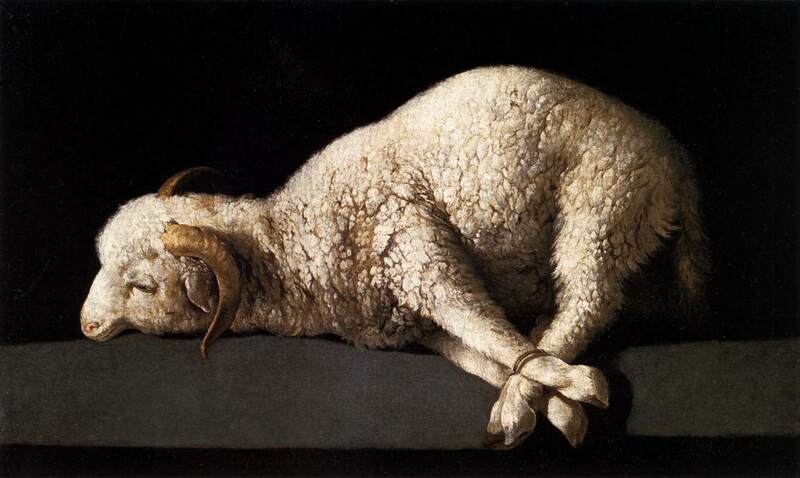 We are the people of His pasture and the sheep of His hand. When we pray that the righteous God would come and put an end to evil, we pray that He would also be true to His mercy and goodness. As He has remembered His promises to Adam, Abraham, Isaac, Jacob, Joseph, Moses, and many others, so we pray that He remember His promise to remember our sins no more. The Holy Bible: English Standard Version (Wheaton: Standard Bible Society, 2001), Is. 63:15; 64:1.